A solar eclipse happens when the Moon passes in front of the Sun and casts a shadow across Earth. It's also known as an occultation. The reason solar eclipses happen is that the distance between the Sun and the Earth is about 400 times the Moon's distance from the Sun and the Sun's diameter is approximately 400 times larger than the Moon's. What this means is that the Sun and the Moon both have a very similar size when viewed from Earth, so when the Moon passes in front of the Sun, it blocks the light from reaching Earth. Partial solar eclipse. This is when the Moon does not line up completely with the Sun, and so only partially blocks the sunlight from reaching Earth. Annular solar eclipse. This is when the Moon and the Sun are both exactly in line but either the Moon is further from Earth or the Earth is closer to the Sun. When this happens, the apparent size of the Moon is smaller than that of the Sun and the Sun then appears as a very bright ring, or annulus, surrounding the dark disk of the Moon. Total solar eclipse. A total eclipse happens when the dark silhouette of the Moon completely covers the intense bright light of the Sun. Only the much fainter solar corona is visible during a total eclipse. Each year there are between 2 and 5 solar eclipses. 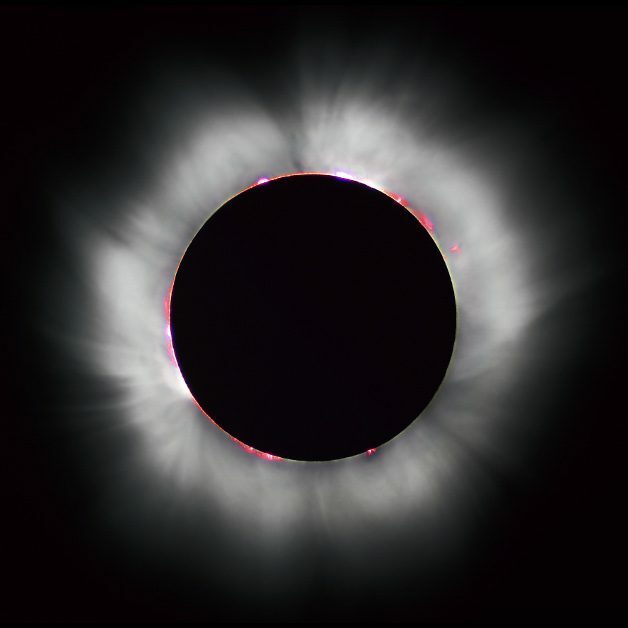 The total solar eclipse, when the Moon completely obscures the Sun and leaves only the faint solar corona, is known as a Totality. Total solar eclipses are rare, happening only once every 18 months. There is another type of solar eclipse, known as a hybrid eclipse, which shifts between a total and annular eclipse depending on where you view it from on Earth. These are comparatively rare. From either the North or South Pole, only a partial solar eclipse is able to be viewed. A total solar eclipse can last a maximum of 7 minutes and 30 seconds. 269 km is the maximum width of the path of totality. Almost identical eclipses occur after 18 years and 11 days – known as the Saros Cycle.